We are excited to announce the release of our new book, Commissioned: How God is Changing Lives, Transforming Nations and Involving You, by Dan Jarvis. Dan went to South Asia and joined our Indian team for a few weeks to collect stories, ideas, pictures and perspective from the dusty hills of central India, the tangled traffic of Chennai and the tropical seashores of Sri Lanka. It’s an unforgettable journey that uncovers a book-of-Acts reality; God’s power is at work in mighty ways – in places of great darkness, an even greater light is shining! To order your copies, contact our Hudson, Ohio office. The books are available for a suggested donation of $8 per copy, or, if you order 10 or more, then just $3 per copy (shipping included). >>Order online or call 888.352.4451 to receive your copies. 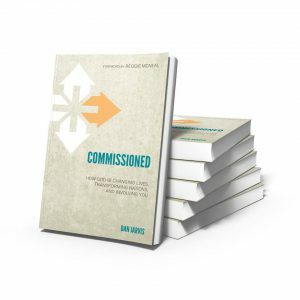 Am I able to get an electronic copy of “Commissioned: How God is Changing Lives, Transforming Nations and Involving You”, or do you know where in Sydney, Australia I might be able to get a copy?